Have you heard the tale of the Post-it® note? It is an accidental discovery that leads to discussion about the strength — or lack thereof — of adhesives. As the story goes, in 1968 Dr. Spencer Silver, a chemist for 3M, was working diligently to develop a super strong adhesive. Rather than achieve that prescribed goal, he ended up developing an ultra light adhesive. Some may have quietly let that “failure” go, not wanting to own up to a shortcoming amongst colleagues. Instead, Dr. Silver decided to share his discovery and own this unexpected experimental outcome. The story doesn’t stop there. After 6 years, one of Dr. Silver’s colleagues was singing in the church choir and was increasingly frustrated with how his bookmark kept slipping from the pages of his music sheet. He then remembered the light adhesive discovered by Dr. Silver and knew he was onto something. In that “aha!” moment, an invention was born that ubiquitously graces the desks, walls, and offices of many of us today. Adhesives–whether sticky tabs, packaging tape, or medical devices–are incredibly important in our everyday lives. Not all adhesives are the same; a sticky tab would be ineffective at taping a needle to your arm in the ER, and bandage tape wouldn’t work very well when trying to ship a package overseas. These differences boil down to adhesive strength. Post-it® notes chemically adhere to the materials they’re attached to. When you place these sticky pads on a surface, they stick with fairly weak adhesion. But just how weak? 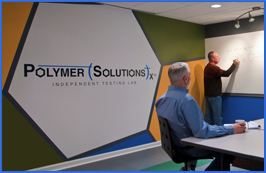 That’s where analytical testing comes in! In order to test the adhesion of a Post-it® note, we employ a tensile test frame. The tensile frame pulls the two adhered layers apart and measures that force in pounds or grams. Since Post-it® notes come in a variety of sizes, that force is reported as pounds per inch or grams per centimeter of width . The more surface area the pad would have for adhesion, the stronger the bond between the two layers. How strong is too strong, though? Well, that depends on the application. 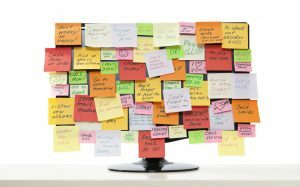 For a Post-it® note, the adhesive must be strong enough to stick and not fall off the desk, refrigerator, or table you lay it on. It must also be weak enough to be removed without ripping the paper of the note. The fact that Dr. Spencer Silver accidentally got this ratio of strength correct for this very specific application is remarkable. He found an adhesive formulation that allows people to attach these notes and remove them without damaging the surface that it was attached to or the note itself. That’s pretty exciting, especially for a mistake! Adhesives can be “too strong” in other applications, though. Our Technical Director, Dr. Jim Rancourt weighed in on this. He said that packaging materials for food products are often too strong–far stronger than they need to be. “There is an opportunity for the packaging used for common food products, those served on airlines for example, to have reduced adhesive strength. An intentional reduction in adhesive strength would allow packages to be opened more easily without sacrificing the integrity of the package during shipping and storage. Analytical testing can be used to confirm that the adhesive strength of the package is more optimized, ” said Jim. If you are curious about your adhesive product and need to assess and understand it’s strength please let us know!